Lady and the Blog → Contest → 48 Hour Contest: A Bag Full Of Grocery Staples Plus $25 To Shop More! 48 Hour Contest: A Bag Full Of Grocery Staples Plus $25 To Shop More! With tightened family budgets, Stop & Shop is re-introducing its Guaranteed Value product line with a new look and new products all at compelling prices to help customers cut costs on a variety of products that every household needs. All of the approximately 200 Guaranteed Value products have been quality tested and Stop & Shop will continuously be adding new items to help customers save throughout the store. Customers will find Guaranteed Value products at prices averaging 20 to 25 percent less than what they would pay for similar national brands and more than 60 percent of the line is sold for $2 or less. The former Guaranteed Value yellow, blue and red packaging has been replaced with a bright, energetic orange and white design that highlights the value offered with each product. Free of expensive packaging, graphics and “frills,” the new design makes Guaranteed Value products easy-to-find on the shelf. “Stretching budget dollars is quick and simple … just look for the orange and white package,” continued Robinson. Customers will find Guaranteed Value products in virtually every aisle of the store, including dairy, meat and produce departments. Cereal, snack foods, spaghetti sauce, canned vegetables and ice cream are just a few of the items created with today’s budget in mind. Household items such as laundry detergent, paper towels, cutlery and trash bags and health and beauty care products such as toothbrushes and body wash are available. Even pet owners can get in on the savings with Guaranteed Value dog and cat food, treats and litter. 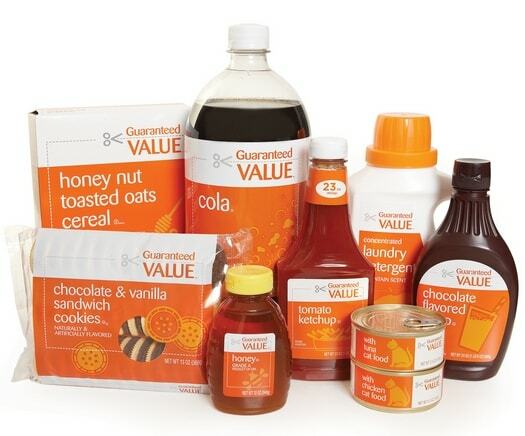 For more information on Stop & Shop’s Guaranteed Value products, visit www.stopandshop.com. PLUS a $25 gift card so you can shop for additional items. Become a fan of LAB’s Facebook Page. Then leave a comment on the wall saying you love the Stop&Shop Bag Full Of Grocery Staples Plus $25 To Shop More giveaway. Tweet this message: “Hope I win Stop&Shop Grocery Staples + $25 To Shop More giveaway from ladyandtheblog.com (@verasweeney). RT to Enter #contest #giveaway”. Fan Stop&Shop on Facebook and leave this link on their wall saying you are entering the Stop&Shop Bag Full Of Grocery Staples Plus $25 To Shop More giveaway on ladyandtheblog.com. I was already a fan of your Facebook page. Fan of LAB’s Facebook Page and commented.